The Nakem Leadership Institute (NLI) is a nine-month fellowship project of the Community Education-Civic Engagement Program (CECE) at Kokua Kalihi Valley Comprehensive Services.The primary purpose of NLI is to address issues of mental health and wellbeing of men and boys in Kalihi. This program will train young people through popular education methodology and bridge them to elders, cultural practitioners, and expanding their respective cultural wealth. NLI will cultivate critical consciousness, leadership, and community action among young people of Kalihi and Hawaii to support alternative narratives, spaces, and structures that are affirmative of health. participants will have gained knowledge and skills needed to address issues underlying mental wellbeing in Kalihi and the larger Hawaii. 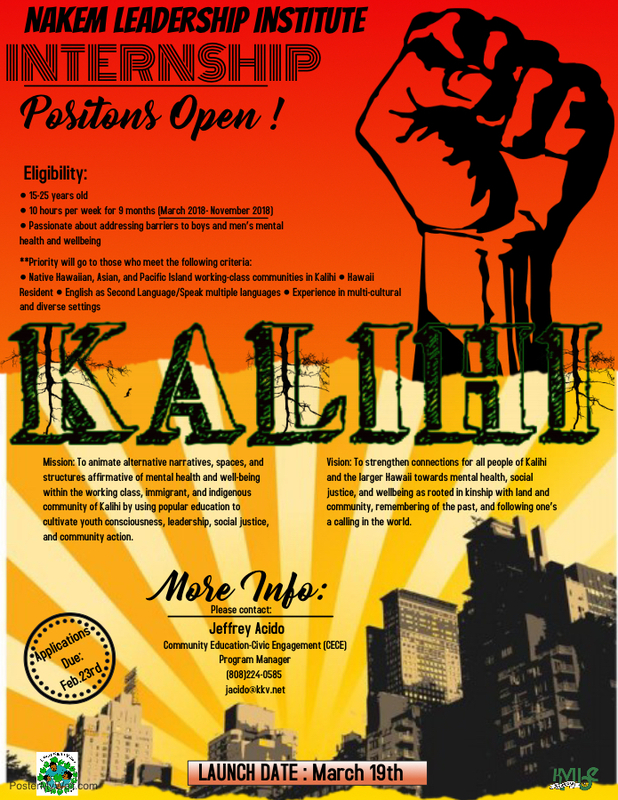 Mission: To animate alternative narratives, spaces, and structures affirmative of mental health and well-being within the working class, immigrant, and indigenous community of Kalihi by using popular education to cultivate youth consciousness, leadership, social justice, and community action. Vision: To strengthen connections for all people of Kalihi and the larger Hawaii towards mental health, social justice, and wellbeing as rooted in kinship with land and community, remembering of the past, and following one’s a calling in the world.